Seven surface sediment samples covering the general geographical area of Florida Bay were examined through the measurement of 13C isotopic abundance and lipid classes to assess the distributions and sources of organic matter (OM) in this estuarine environment. The bulk δ13Corg value shifted from a more isotopically depleted (−19.9‰) to a more isotopically enriched (−13.5‰) signal along the NE to SW transect. Two geochemical proxies (Paq and C25/C27 n-alkan–2-ones) indicative of seagrass-derived OM significantly increased from near-shore to offshore areas, while taraxerol, a biomarker for mangroves, substantially decreased from 7200 to 284 ng/g along that transect. A clear spatial variation of OM sources was observed in Florida Bay. Generally, the sites in the NE contained mixed OM sources of terrestrial (mangrove) and seagrass-derived OM, where the terrestrial component accounted for over 60% of the OM. In contrast, the sites in central and SW Florida Bay were strongly dominated by seagrass-derived OM. Other lipid fractions such as fatty acids, n-alcohols and sterols revealed an important contribution of algae and bacteria especially in the central and SW section of the Bay. Relatively abundant C25 HBIs suggest important marine diatom inputs, while the presence of C20 HBIs particularly in central Florida Bay possibly reflects the contribution of cyanobacterial mats. 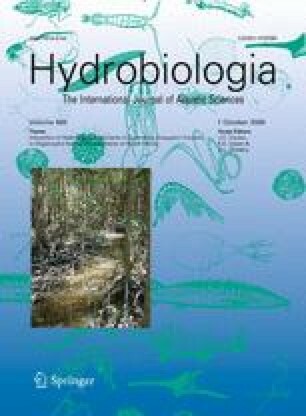 The molecular proxies developed in this study to assess OM sources in Florida Bay are promising tools for the characterization and seasonal variability assessment of OM in this and other similar subtropical and tropical estuaries and for paleoenvironmental studies. Electronic supplementary material is available for this article at http://dx.doi.org/10.1007/s10750-006-0131-2 and accessible for authorised users.